Our range of lightweight mobility scooters feature increased functionality and ease of use. The scooters are great for easy disassembly and loading into either a car or coach, making them great for those days out with the family or group. Find out more about our lightweight mobility scooters by visiting our website. Mobility Nation offer quality products direct to the public at wholesale prices cutting out the middlemen. Why pay premium prices from your local mobility scooter shop when Mobility Nation have great and cheaper prices. We have a range of Car transportable mobility scooters available, the first being the Explorer 4 - 4 Wheel Mobility Scooter and the second being the Scout Light Weight Car Boot Mobility Scooter. For further information about our Car transportable mobility scooters please visit our website or call us on 02476 713 913. Why pay premium prices for a mobility scooter from your local mobility scooter shop, when we import direct from manufacturers and sell them straight to you. This ensures high quality for a reasonable price. We cut out the middle man so you don’t have to worry about each link in the business adding on extra money so you get the best prices. 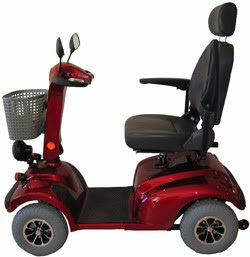 Here at Mobility Nation we sell a range of mobility scooters, some of which are designed with car transportability in mind. This includes the Explorer 4 - 4 Wheel Mobility Scooter which features an 18 mile range and a seat slide adjustment and includes 1 month free insurance! Our car transportable scooters are perfect for those family holidays or a day trip away. Find out more by visiting our website. This short video shows how you can easily take apart and load your Explorer 4 car transportable scooter into your boot, making it perfect for travel. It is one of the many portable mobility scooters we offer at Mobility Nation. Find out more about our mobility scooters by visiting us online.